We used the soufflé as a side dish to marinated butterflied chicken on the grill. No carbs and tons of flavor. Chicken and Waffles or Biscuits? Jamais! I used an 8 ½ by 11 and 3 in deep soufflé dish, larger than usual, so my ingredients match that. If your dish is smaller and taller, like the more conventional soufflé dishes, decrease by one egg, and maybe a little less cheese and greens. But no need to decrease anything else. Preheat oven to 400° then after you have placed soufflé into the oven, reduce temp to 375°. 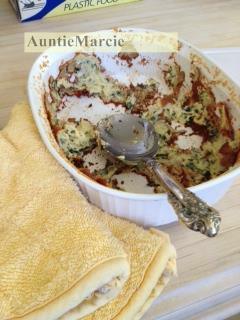 Generate the butter in dish and coat with grated Parmesan cheese. Stir the butter and flour together in the bottom of a heavy sauce pot. After a few minutes, when the flour is ‘cooked’, slowly stir in the scalded milk with a wire wisk. Stir it up. It will thicken up. How much? Don’t worry about that. Just make sure it has thickened so it is not milky but silky. REMOVE it from the HEAT now and add each yolk one at a time and wisk it up after each addition. Then add the spices, cheese, greens and stir together. Store off heat in the pot just like that. Sprinkle the cream of tartar over the egg whites and beat until stiff peaks form. Don’t add the cream of tartar until you are ready to beat the whites because it will not combine – it will clump up. Take about 1/3 of the whites and stir into the yolk mixture. Then fold in the rest gently. Pour it all into the greased and parm cheese coated soufflé dish. Make a circle in the top of the batter with your spatula, about an inch away from the sides of the dish. This assures an even rise – can you picture this? The batter is in the dish. You insert your spatula and cut it around, inside and away from the sides like if you were tracing a circle in your bathtub around your body away from the sides of the tub…in fact…take a nice bath while the soufflé bakes!!! Serve it immediately…yes, I mean you have to time this so it is all served and spooned out of the pan and eaten right then otherwise you will have Yorkshire pudding to serve instead of fluffy soufflé!